GPS guard tour tracking software and electronic guard patrol tracking apps are two names for the same thing: Real-time situational awareness of your security officer’s latest position and activities. GPS (Global Positioning System) capabilities are now built into most guard management software and guard tracking app solutions. It is the manner in which the GPS functions that determines if a particular guard management system offers the best security guard app for you. Most security guard company software providers jumped onto the GPS/ electronic tracking bandwagon as soon as possible, and understandably so. Security is a REAL-TIME business, so real-time situational awareness is crucial. The problem is that early GPS capabilities created “bread-crumb trails”, electronically “pinging” your officer’s device every 15 or 30 seconds. So why was a breadcrumb trail of your officer’s momentary position a “problem”? Because the result was hot phones, high data usage, and quick battery drainage. GuardMetrics has evolved to use ULTRA-low data and battery (the equivalent of a TEXT!) so that your officers can even login through their personal mobile smart-phone and the GPS tracking won’t cost them in battery OR data! Call, or click here, for a demonstration of why this GPS/ electronic guard tracking system will save you money! Our development and Support team spent decades as security guard company officers, managers and owners, so knows what you need: efficiency and affordability. It is with this seemingly simple knowledge that GuardMetrics has developed a GPS guard tracking system and app that does just that. The only time the GPS guard tracking software kicks in is when any activity is submitted; i.e., checkpoint scans, activity reports, incident reports, visitor logs, etc., ALL come to you with attached pics and videos and a geotag satellite photo of exactly where the officer is…and, again, all with data usage measured in the low megabytes! GPS / electronic guard patrol and tour tracking has reached a new level, and it is a level that provides your client with everything they need, all while saving you money. 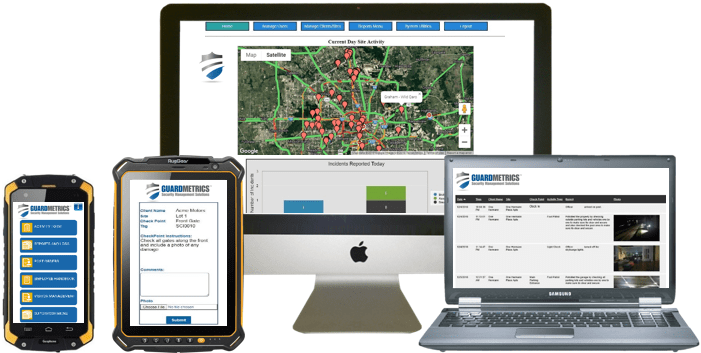 Call GuardMetrics today to see if our GPS/ electronic guard tracking system is the best guard tracking app for you! And as you may have guessed, real-time GPS / electronic security officer tracking is only part of what GuardMetrics includes in the GuardMetrics-PatrolTrack security guard management system. Included: the guard tour and patrol tracking app, mobile activity reporting and incident reporting with relevant pics and video, post order management, visitor management, a “Client Portal” where your clients have all their reports stored and viewable in any manner they wish to view them (once you approve them), The Community Security Portal and more. And it is ALL branded to your security guard business! Don’t settle for GPS / electronic security guard tracking apps that drain your battery and your bank account. Let a GuardMetrics expert show you a security guard management system that is branded to you, and gets your clients everything they could desire, without breaking the bank. Call GuardMetrics now for an affordable GPS / Electronic guard tracking system that will make your clients happy!